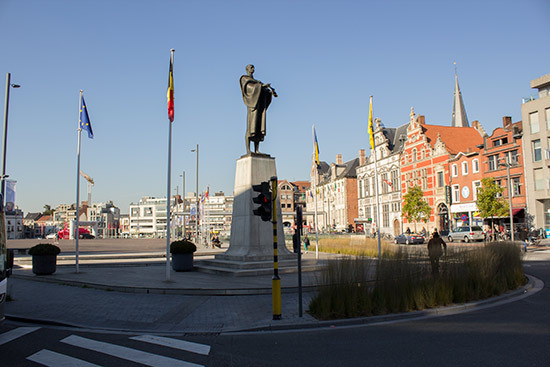 Location: JC Den Eglantier, Apostelstraat 13, 9100 Sint-Niklaas, Belgium. 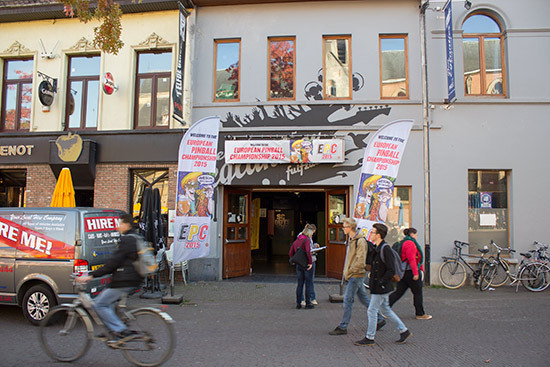 The JC Den Eglantier nightclub on the square next to the church of Sint-Niklaas has been home to the main Belgian open tournament for the previous two years, but in 2015 the Belgian Open Pinball tournament stepped aside to make way for the European Pinball Championship or EPC. 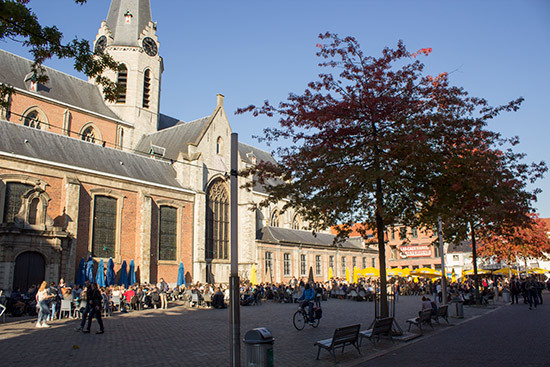 The Church of Sint-Niklaas is on the square (on the right of the picture above), with restaurants and bars to the side and behind. It is on one of these side streets that we find the JC Den Eglantier nightclub, which was taken over this weekend so it could host the EPC. 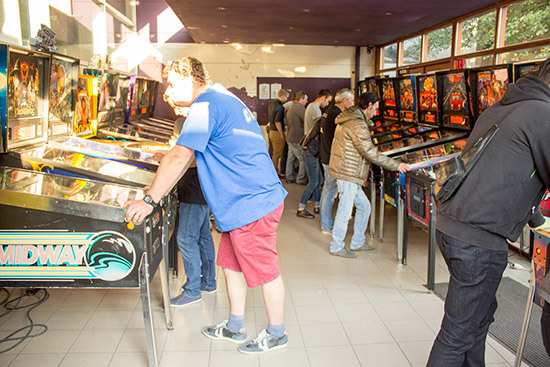 Our first visit to the Belgian Open Pinball weekend was in 2012 when 87 players took part. Three years later, and the EPC was over-subscribed with 300 places available. 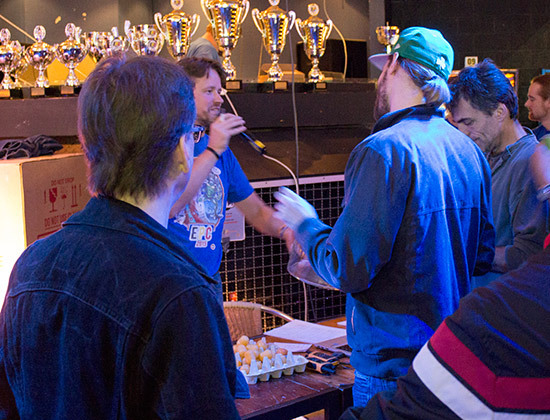 Entry to the event cost €45 ($51/£33) which included entry to the EPC tournament, one entry in the Classic Tournament, and some tokens for drinks or food. It's curious licensing issue, but food and drink could not be bought directly for cash and had to be purchased using green or red tokens worth €1.50 or €0.50 respectively. Further tokens, along with additional Classic entries, could be purchased at the entrance to the building. As you walked into the main hall, the EPC machines were arranged along the right wall. The control desk was raised above the main floor and featured the many trophies to be won this weekend. Then on the other side of the desk were more EPC machines. At the far end of the main hall was an area set aside for the Team Tournament. 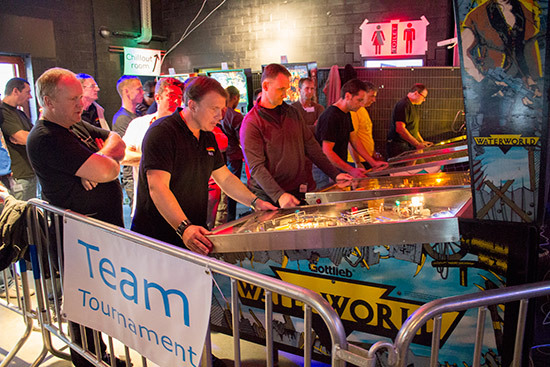 The players in the eighteen teams competing had their own machines and, like the main EPC, the qualifying rounds took place on Friday afternoon and throughout Saturday. At the back of the Team Tournament area was an exit from the main hall into the patio area. With smoking inside any of the buildings prohibited, this became the smoker's refuge, although it was also the eating area. 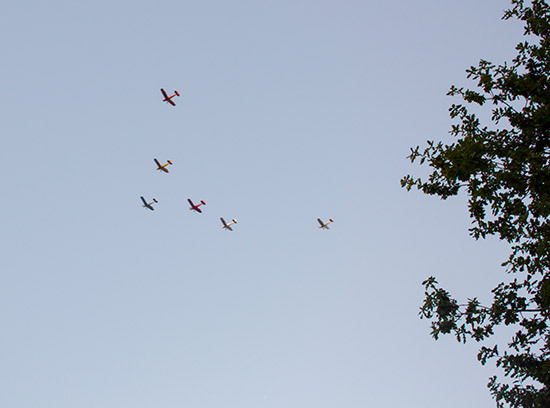 Thankfully the weather remained dry and warm throughout the weekend with sunshine, blues skies, and the occasional fly-past. 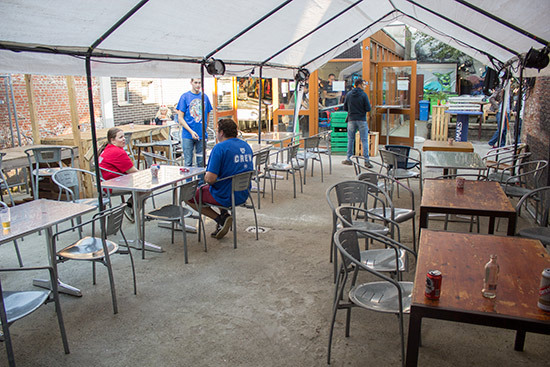 To the right of the patio was a practice room containing sixteen more machines. A conservatory beyond the patio was also filled with machines on which players could practice. 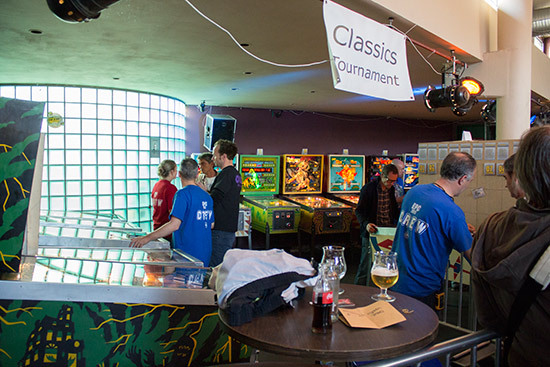 Just to the left of the picture above was the entrance to the final room, which contained a second bar, more practice machines, the Classic Tournament, and the Winner Takes It All tournament. 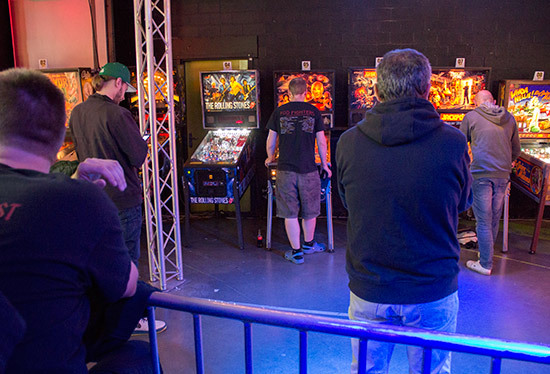 While there were plenty of practice machines available, the vast majority of visitors were there to compete in the main EPC tournament. 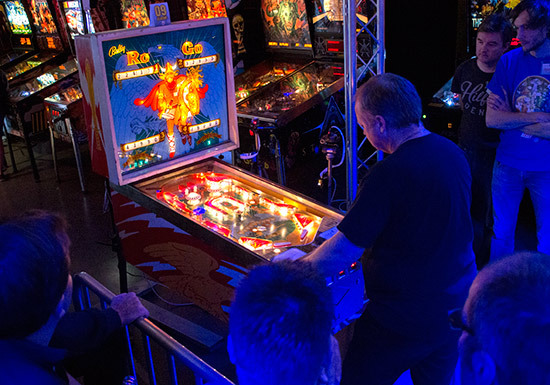 The format consisted of a qualifying round in which all 300+ players competed, followed by a series of double-elimination matches for the top 68 qualifiers. To accommodate so many players, qualifying was split into six rounds (A-F), each two hours and thirty minutes long. The first two of these began on the Friday afternoon - 3pm and 5:30pm - with the remaining four spread throughout Saturday, at 10am, 12:30pm, 3pm and 5:30pm. 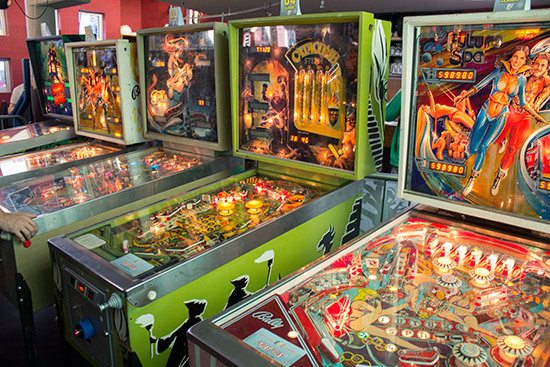 During qualifying, players could choose any eight of the twenty-four machines on which to play a single 3-ball game. 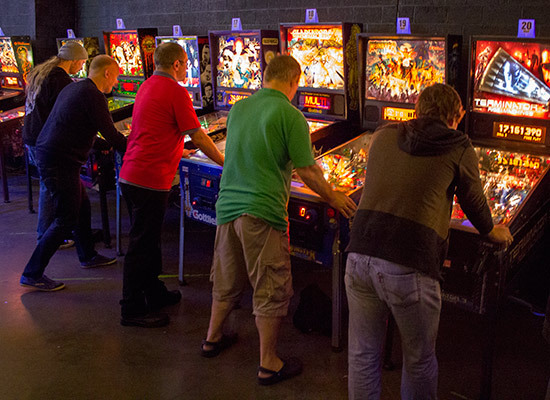 The scores on all machines were ranked and points awarded according to each player's position. 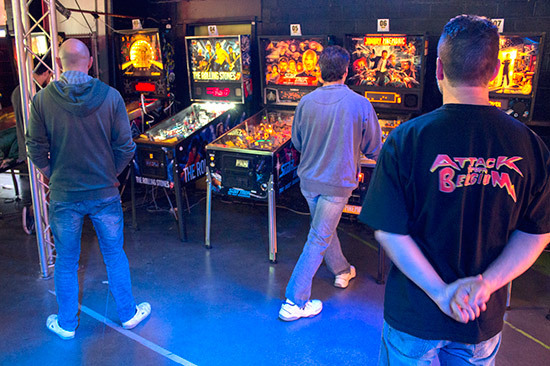 The total of the points score on all eight machines made up a players total score. In addition, each player had a 'joker' which they could use to replace their worst-scoring game. Use of the joker was optional and it could be used on a totally different machine if required, but once employed it automatically replaced the worst of the original eight games, even if the joker game was worse still. 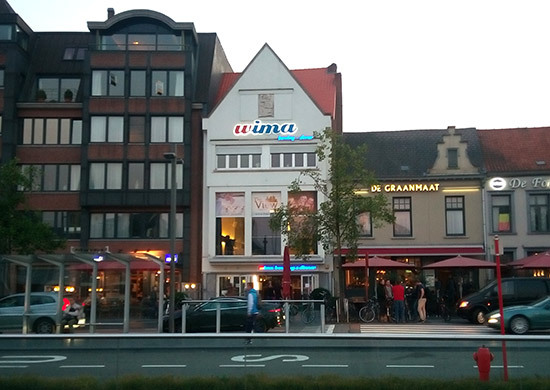 After the first two qualifying rounds were over on Friday night, the venue closed as a special dinner was held across the square at the Wima bowling centre for those who paid the €55 ($62/£40) ticket price. 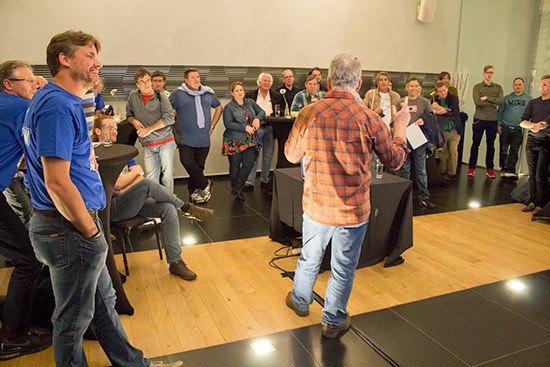 The evening began with an introduction from Lieven Engelbeen. 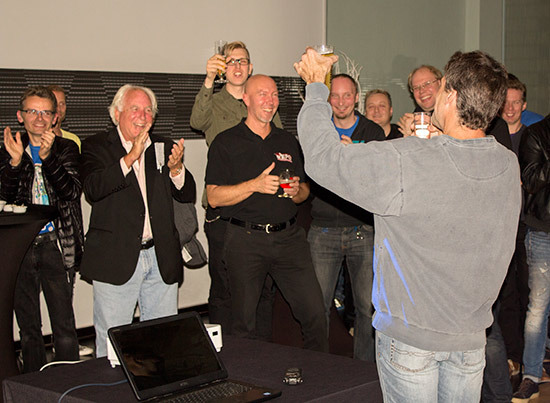 Two special guests were originally scheduled to attend the EPC and speak at the dinner - Greg Freres and Lyman Sheats - but Gary Stern was also in Europe for the EAS show in Sweden, so he too attended the event and spoke briefly at the dinner. 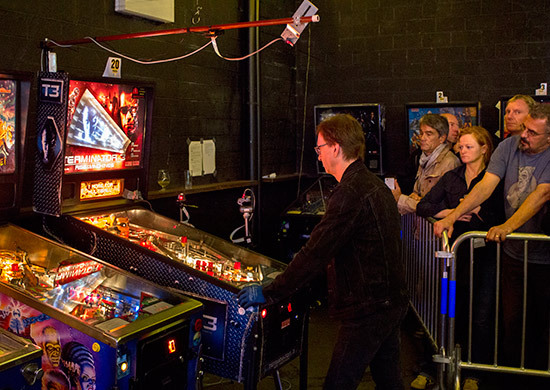 Then Lyman spoke about his career in pinball, programming games and writing operating systems at Williams, Data East and Stern. 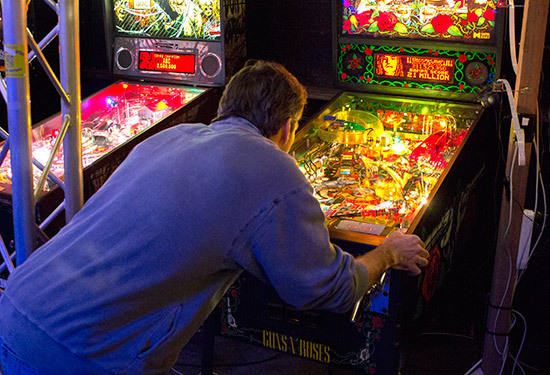 He explained what a pinball programmer really does, including making games fun and ensuring they don't catch on fire. At Williams he said people only moved up the ladder slowly, then they throw you in the river to see if you sink or swim. 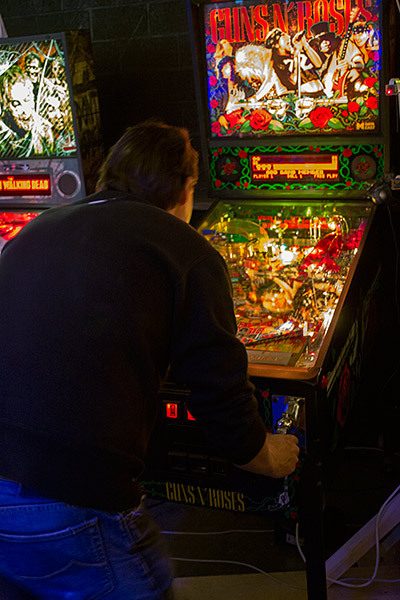 He began with the swear ROMs for Demolition Man, writing code for a Theatre of Magic test fixture and display/lamp effects for No Fear where he first worked with Steve Ritchie. 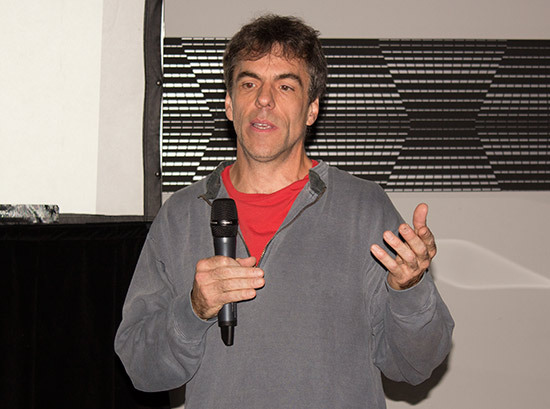 Lyman then described working with Brian Eddy on Attack from Mars and Medieval Madness, how the games were created and developed, and how the features changed on the way to production. 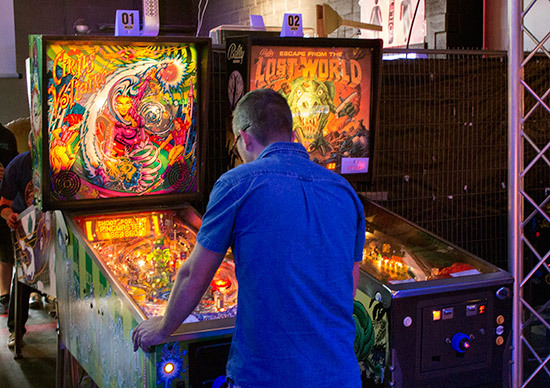 He then covered his work on Monster Bash before turning to his time working at Stern pinball, where he was deeply involved in developing code for the S.A.M. hardware platform. After talking about his work on Transformers and Tron, he turned to AC/DC and what he and Steve wanted the game to be. Lyman was supposed to team up with Steve again for Star Trek but ended up on Metallica with John Borg who wanted the game to play snippets of each song like Guns 'N Roses on which they had previously worked, but instead it ended up playing one track at a time like AC/DC. 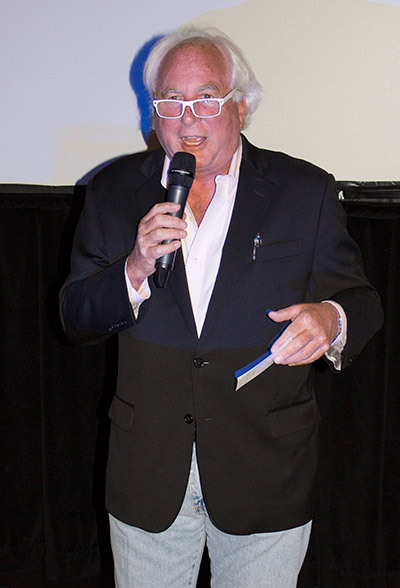 Click here to play the MP3 of Lyman's talk, or right click to download the file. You can also use the player below to play it within this page. Then it was time for the meal. 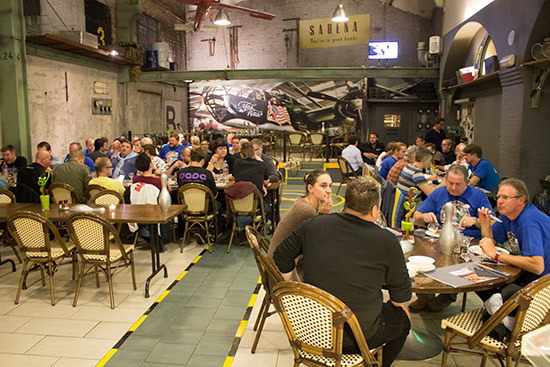 Guests moved downstairs to the dining area where they enjoyed a tasty dinner buffet. 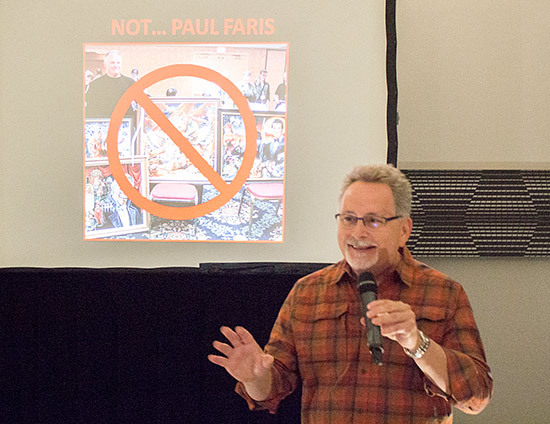 After dinner, everyone returned upstairs as Greg Freres gave a presentation about his pinball artwork and his collaboration with Dennis Nordman on Whoa Nellie! Big Juicy Melons. But Greg began by explain not who he is, but who he isn't. 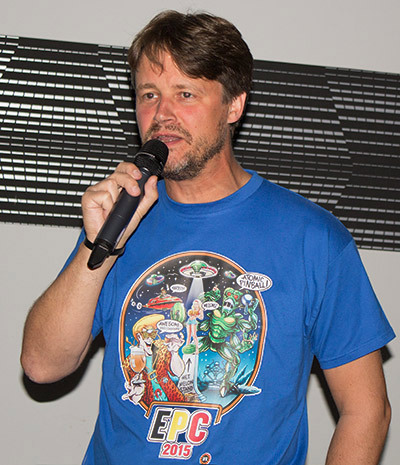 Greg then spoke about many of the game on which he created the artwork, including Fathom, Star Trek - The Next Generation and Revenge from Mars, right up to his work on Stern's latest title, Game of Thrones. Then Greg turned to the creation of Whoa Nellie! 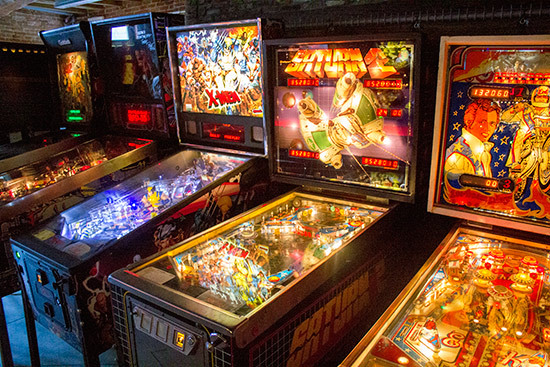 Big Juicy Melons, the building of the original four custom games, and the way it was eventually produced at Stern Pinball. 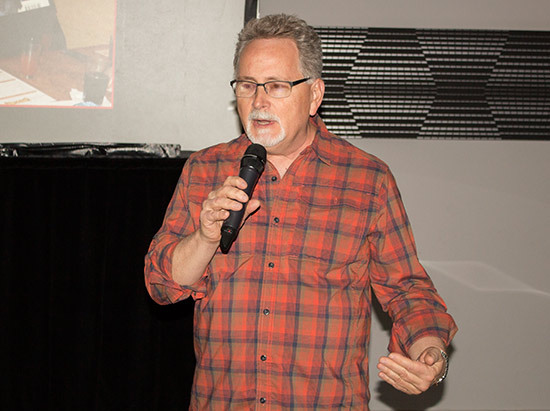 Click here to play the MP3 of Greg's talk, or right click to download the file. You can also use the player below to play it within this page. Saturday's action began at 10am with the first of the day's four qualifying rounds. The process of playing a game was a little involved but worked well enough. Each machine had a laminated card with the number on it. 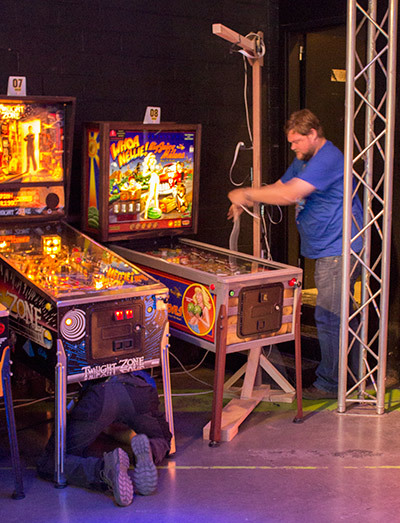 To play a qualifying game, players had to choose their machine and notify an official. 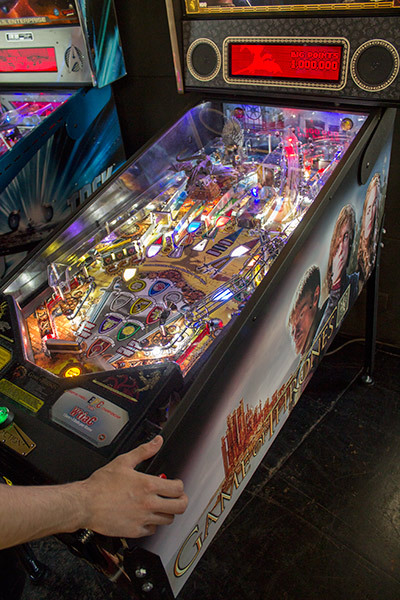 If the machine's card was on one of the boards in each area then it was available to play. The official then clipped the player's badge onto the card and gave it back to the player. If the card was not on the board then the game was already being played, and the player's badge was hung on the board until the card returned. As soon as the card returned it was paired up with the next player's badge and they could go to the machine. Once there, another official would take the badge and card and hold onto it until the game was over and the score recorded on a tablet. 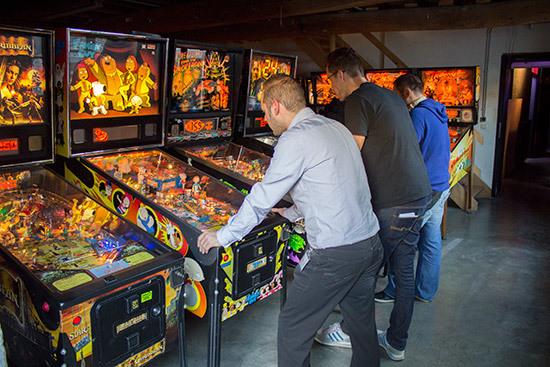 Rather than using the start button, each machine was fitted with an electronic sensor which could only be operated by one of the EPC staff members using a special tag. This prevented games being restarted surreptitiously, while the holding of the player badge ensured nobody walked away during a game. 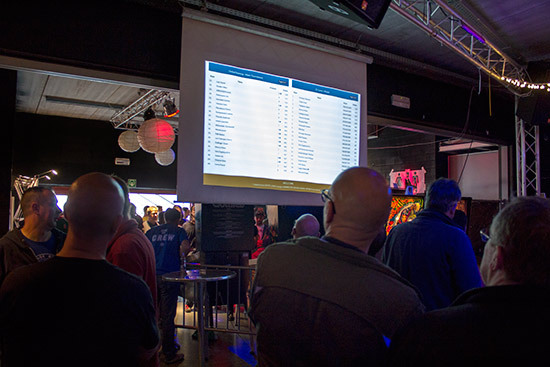 The overall scores were shown on a projector screen, while two touchscreen terminals were available for players to check their own scores and their ranking in any of the tournaments taking place over the weekend. Joker games could be played during a player's regular qualifying slot, or they could be held back and played during a special final session from 8pm until 10pm on Saturday. This extra session allowed players to tactically work out what the possible benefits and risks were from choosing to play their joker. When the joker session ended, the final qualifying results were announced and players knew whether they needed to return to the hall for 9am the next morning for the play-offs. Here are the qualifying round results. Click on a name to see the scores. 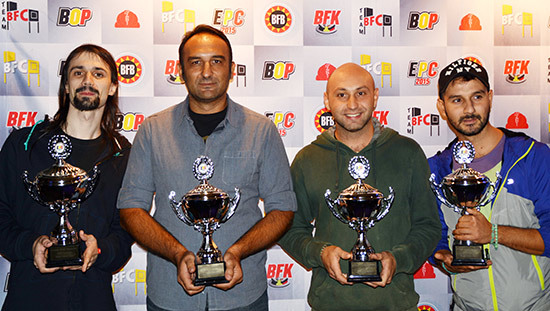 While the EPC qualifying was taking place, two other tournaments were also running. 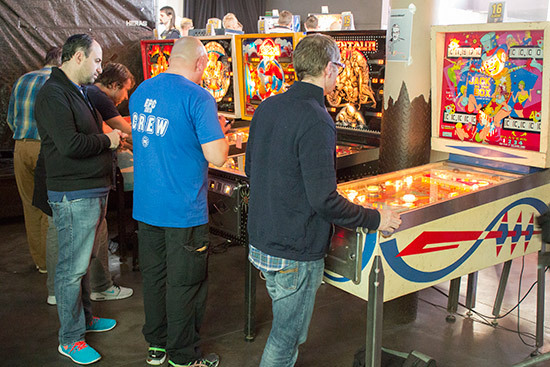 The Team Competition featured eighteen four-player teams, split into three groups of six. Entry to this event cost €20 per team with the three groups playing on either Friday from 3pm to 7pm, Saturday morning from 10am to 2pm, or Saturday afternoon from 3pm until 7pm. In each group every team played a single match against the other five teams in their group. Each match consisted of two games. In one game, two players from each team played against two of their opponents in a four-player game. The second game was the same but featured the other two players from each team. Points were awarded for finishing position in each game; 5 points for winning, 3 points for second and 1 point for third. When all the games had been completed, the two teams with the most points in each group would continue to the play-offs. Meanwhile, right at the back of the complex, the Classic Tournament was taking place and was extremely popular. Entry to this cost €3 per entry, with an entry consisting of three games of your choice from the sixteen machines available. Somewhat annoyingly, entering required a token which could only be purchased from the front desk, right at the opposite end of the building, although one entry was included with your registration for the event. 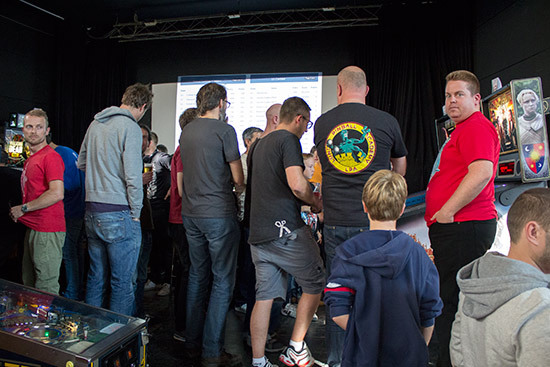 The same queueing system used for the main EPC tournament was used, but the restricted space meant there was always a crowd of players either registering their machine selection, waiting for to play their game, or trying to leave the area. 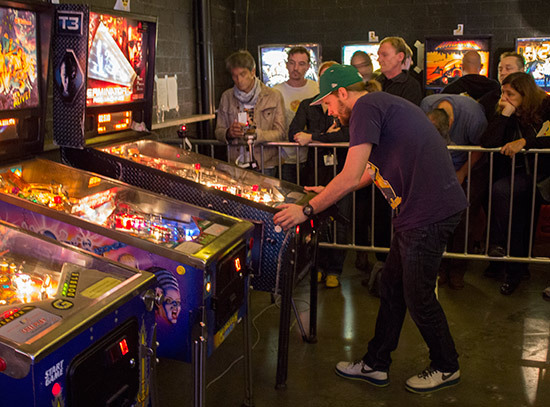 The scores on all machines were ranked and the ranking points from the three scores gave an overall points total for that entry. Entries could be voided at any point before the third score was recorded, since two good scores and one bad one may not be enough to qualify and could adversely affect the points earned in a previous entry. Qualifying would be tough. 244 players took part in the Classic Tournament - playing from 12:45 on Friday until 2pm on Sunday, but only 16 would qualify for Sunday afternoon's play-off rounds. 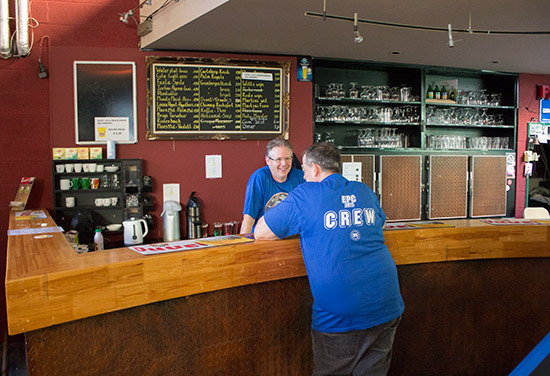 You can take a look around the EPC venue in our exclusive Nine Minute Tour. 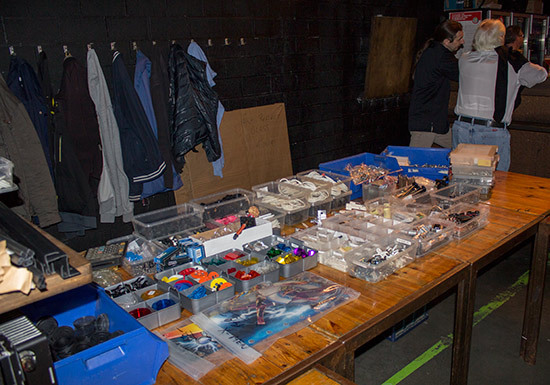 Also on Saturday, a vendor table was set-up near the entrance where guests could purchase from a range of commonly-needed pinball parts. 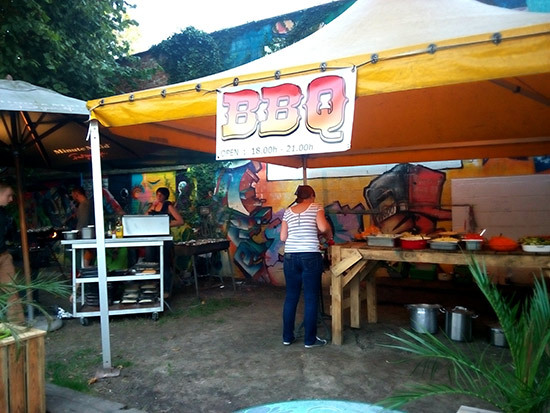 On Saturday evening, a barbecue was held at the rear of the main hall. The cost of this was €15 per person which gave you a steak, a chicken breast, a large sausage and a buffet of salad items and bread. A €10 kids meal option with two of the meat items was also available but, as with the adult version, needed to be purchased at the time of registering for the EPC. 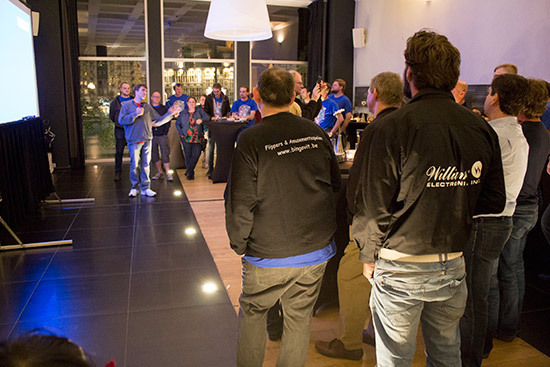 On Saturday at 9pm, the final of the Team Tournament took place. In the three qualifying rounds, the top two teams from each group of six made it through to the final. This was then played in the same format, with each team playing a match against the other five teams. At the end, the winners were the Italian team, with Germany in second and France third. 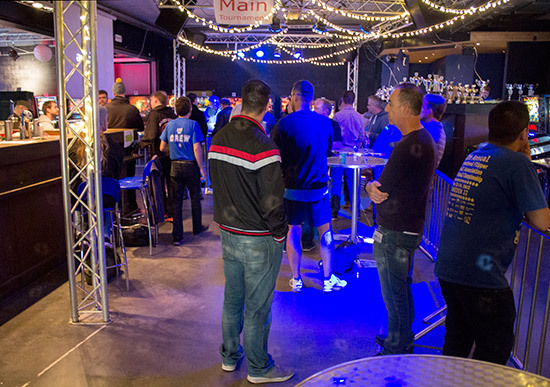 The venue then stayed open until 1am for those who wished to play more games and enjoy the music. 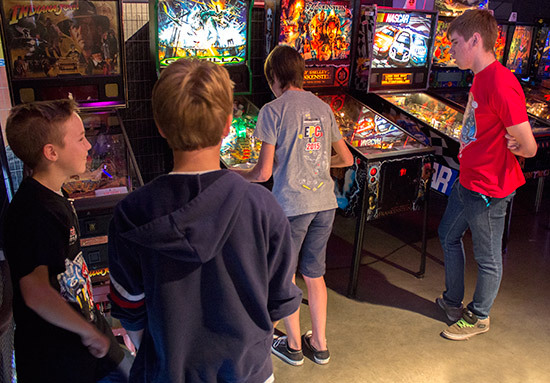 We opted instead to enjoy some of Sint-Niklaas other attractions and ended up playing an Iron Man machine in the bar next door to the EPC, with the loser buying the next round of drinks. Sunday was crunch day for the main EPC tournament and the Classic Tournament, while it was also the day for the Youth Tournament. 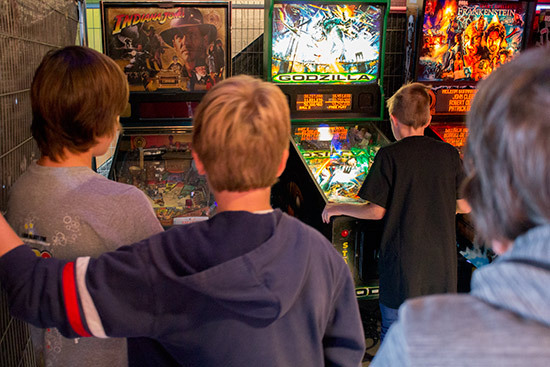 There had been a couple of changes in the machines available to play. 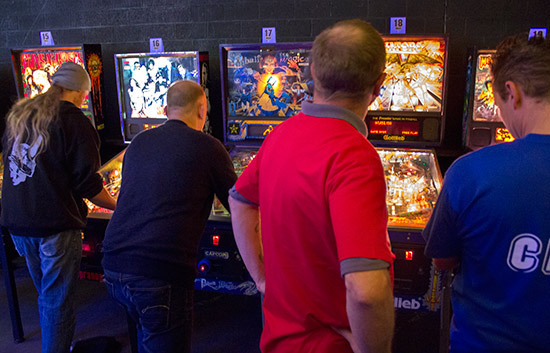 With the Team Tournament now over, those machines were added to the mix, and a couple of substitutions had taken place at the far end of the main row. 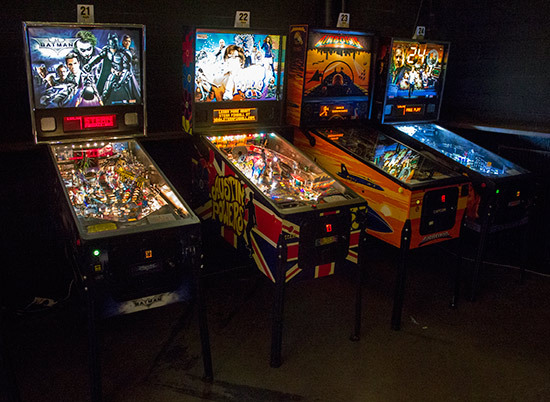 The addition of these machines was no accident, as these for would be used later in the day for the Youth Tournament. Unfortunately, despite repeated calls and a deadline being announced, one play failed to appear in time for the start of the first round and was thus replaced. Predictably, they showed up just moments after the decision to replace them was made. 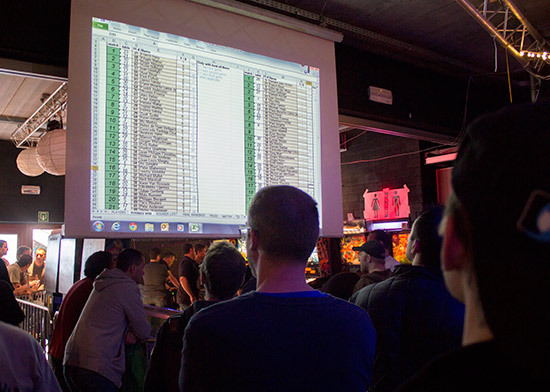 The machines played were drawn at random and the results entered into the computer spreadsheet. 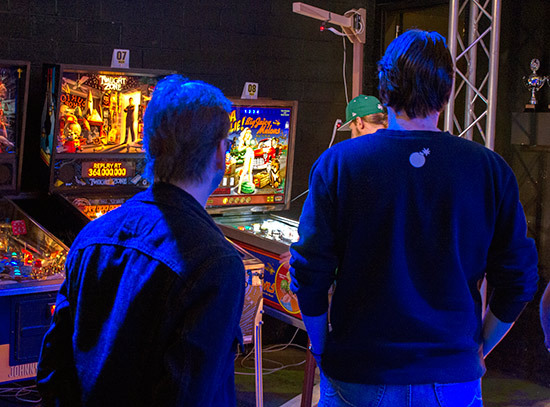 The winners of each match progressed to the next round in the winners' bracket, while the losers dropped into the loser bracket. Matches in the loser bracket were decided by a single 4-ball game. As the day progressed, the number of survivors in the winners' and losers' brackets reduced, with some big names going out but many familiar faces still in contention. At midday, the qualification rounds for the Youth Tournament began, using those four machines at the end of the EPC row which had been rotate round ninety degrees and cordoned-off into their own area. 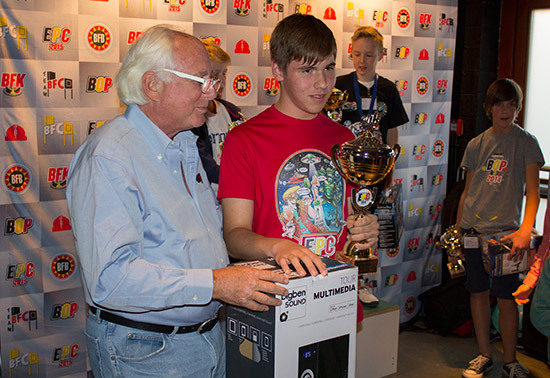 Entry to the tournament was free for players aged 15 and under. 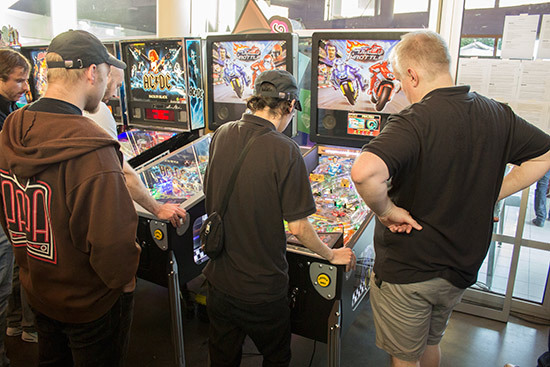 Qualification consisted of a single game on each of the four machines with a joker available if players decided to use it, but unlike in the main EPC it had to be used on one of the four machines played in qualifying. The top four would then go into the final which would be played a little later on Sunday. Those sixteen qualifiers were divided into four groups of four. 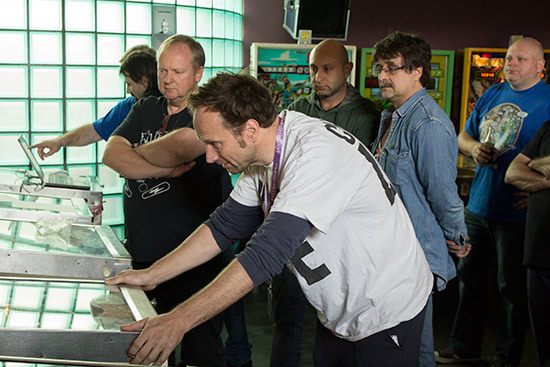 Each group played a single four-player game on a machine drawn at random, with the top two progressing. 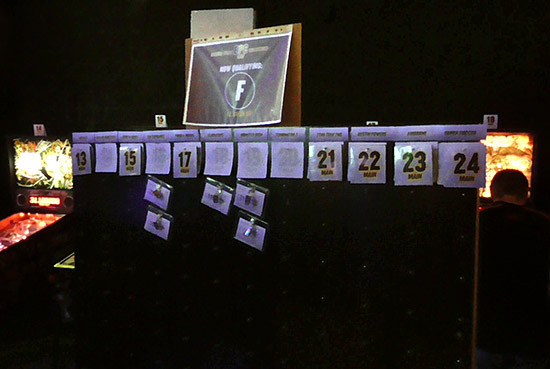 Once the sixteen had been reduced to eight and then the final four, the game which would be used in the final was chosen at random. The winner of the Classic Tournament would win that game, which was the Ro Go by Bally. Back in the main EPC, three of the four finalists from the winners' bracket had been decided. They were, Jorian Engelbrektsson, Paul Jongma and Jochen Ludwig. 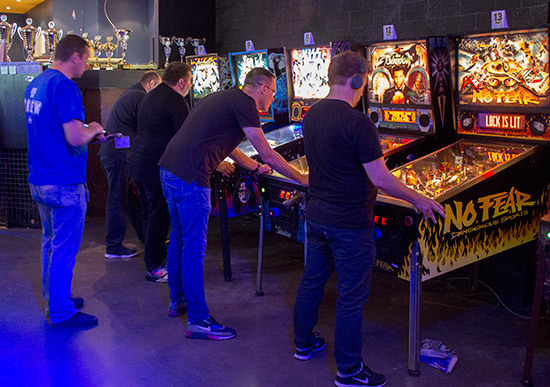 They wold be joined by the winner of the losers' bracket which would be contested by Krisztián Szalai, Lyman Sheats, Mark van der Gugten and Daniele Acciari. 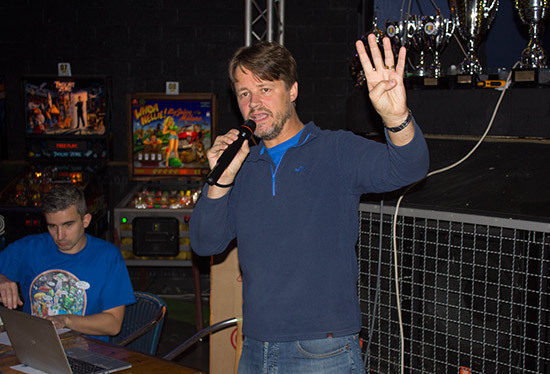 That deciding match was won by Lyman, so he was the fourth finalist. 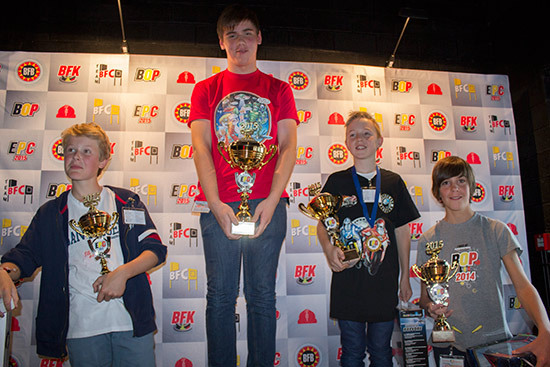 The Youth Tournament was also reaching its final with Emile Quintijn, Korben Van Wonterghem, Thomas Van Clapdorp, and Timber Engelbeen (all from Belgium) in the last four. The final was played on Godzilla. The winner was Thomas Van Clapdorp who was the fourth player and ceased playing when his last ball score overtook the others. Emile Quintijn was second, with Timber Engelbeen third and Korben Van Wonterghem fourth. 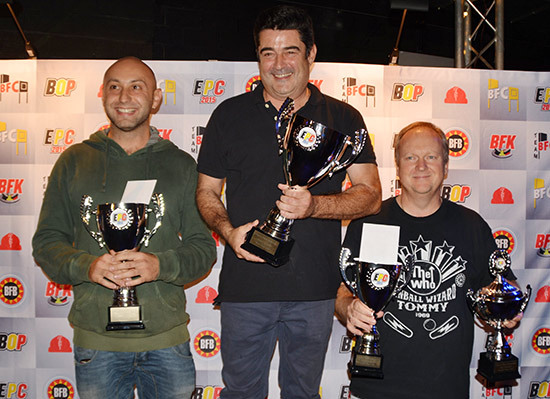 Next came the Classic Tournament final which was a truly international affair, with Daniele Acciari from Italy, Andreas Harre from Germany, Gabriel Ortiz from Spain and Dimitri Van Hove from Belgium playing on the Ro Go prize machine. Going into the fifth and final ball, Gabriel Ortiz was in the lead with 101K, Dimitri Van Hove was second on 74K, Daniele Acciari was third on 60K and Andreas Harre fourth with 47K. The final ball shook up second to fourth but Gabriel remained in the lead to become with winner on 113,170. Daniele took second, breaking through the 100K level to end on 110,430. Andreas moved up a place to third with his 78,410 while Dimitri was very close behind on 77,330. 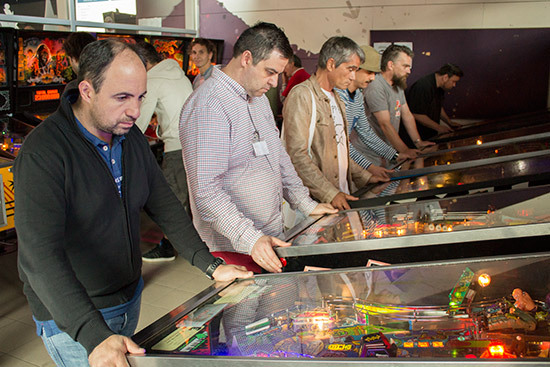 And so we come to the main event, the European Pinball Championship 2015. 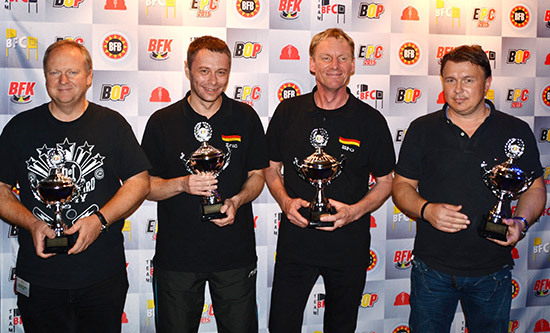 The three-game final would be contested by Jorian Engelbrektsson, Paul Jongma, Jochen Ludwig and Lyman Sheats. 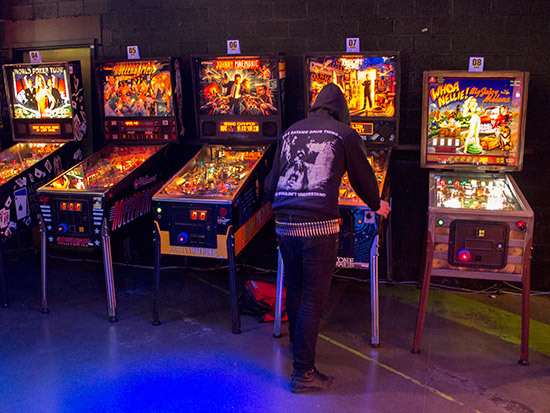 The first three had won through the winners' bracket and so got to choose one machine each to play. Lyman, as winner of the losers' bracket, got to choose the play order of the first game. The machines chosen were Whoa Nellie! Big Juicy Melons, Terminator 3 and Guns N' Roses. 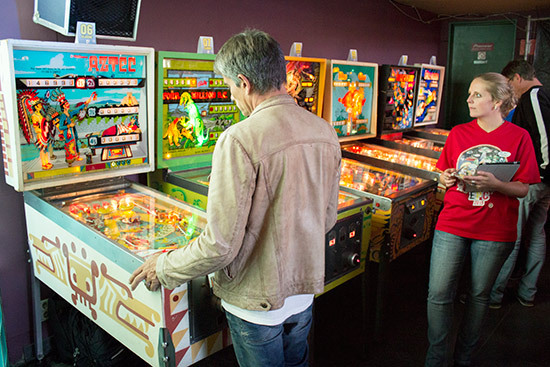 Points would be awarded for finishing position in each game, with four points for the winner, two for second, one for third, and no points for finishing last. 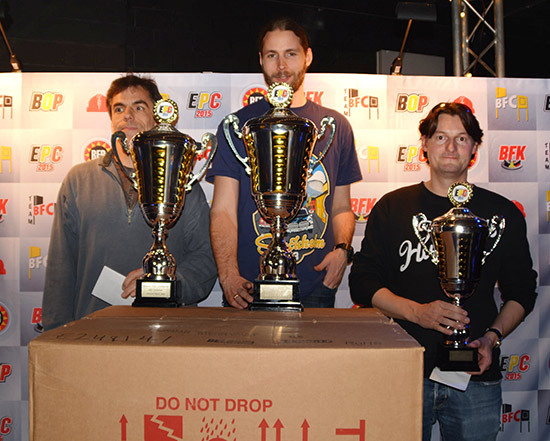 Like the Classic final, the EPC final was streamed live on Twitch TV and is still available to watch. Jochen went first but had the worst start of the four with just 48 points after ball 1, compared to Jorian's 173, Lyman's 239 and Paul's 389. The second ball simply resulted in everyone more-or-less doubling their score, keeping the order the same. On to game two, which was Terminator 3. Jochen had the best start on the second game, scoring 43.5M against Jorian's 9.8M, Paul 4M and Lyman's 1M on ball one. Jorian started Assault on his second ball and managed to increase his score to 79M. 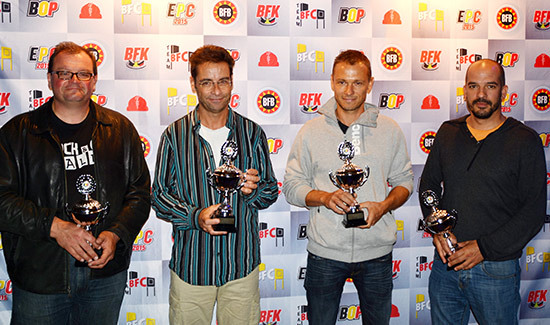 Jochen was second on 54M, while Paul increased his score to 27M and Lyman remained fourth on 8.1M. Jorian reached 100.9M on his third ball to take the lead. Lyman's miserable game continued as he ended in fourth on 11.8M. Paul remained in third on 48.2M, but Jochen passed Jorian's score to take the win. He stopped playing with his score on 110.9M. Any of the four could still win as play moved on to the last game of the final. This would be contested on Guns N' Roses. Paul began well, scoring 202.5M on his first ball. Jochen had a fair start too, ending his first ball on 102M. Lyman was close behind on 93.4M with Jorian last with 59.6M. Paul didn't manage to repeat his first ball and only added 27M on his second. Jochen did repeat his first ball and doubled his score to 200M. But Jorian was the biggest scorer on ball two, ending on 709.7M, while Lyman was not too far behind with his 594.4M. Ball three would decide everything. Paul did well to raise his total to 637.8M but it wouldn't be enough to win, effectively putting him out of contention for the Championship. Jochen 's 553.8M assured him of fourth place, also putting the overall win out of his reach. Jorian has a great final ball, raising his score to 1.48B. If Lyman could push his 594.4M score above Paul's 637.8M, he would tie with Jorian on points and force a play-off. If he could beat Jorian's score he would win the EPC outright. But it was not to be, as Lyman ended his final ball on 614.98M, putting him in third place. 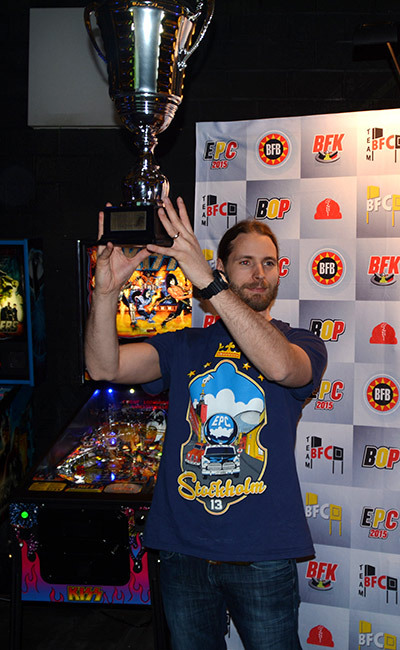 So Jorian Engelbrektsson was the new European Pinball Champion. There was a three-way tie for second, third and fourth which was decided by a tie-breaker game. This was won by Lymanl who ended as runner-up overall. Paul was third overall and Jochen fourth. The play-offs for the Winner Takes It All (WTIA) tournament also took place on Sunday afternoon. The top scorers on the four WTIA machines on each of the three days took part in the play-offs. Unfortunately, because the main EPC tournament was running very late we had to leave before the results were known, but we will update this report with them as soon as they are published. 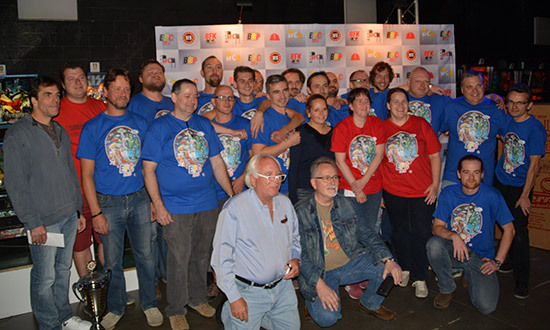 With 300 registered players, of which 291 took part, managing the EPC was no small undertaking but the Belgian team who hosted the 2015 event managed it very successfully. 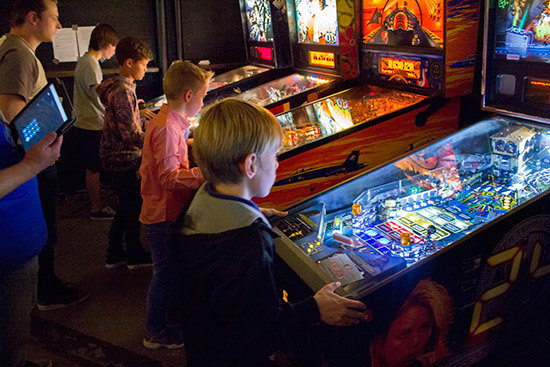 They introduced a number of changes, such as controlling the starting of games and the machine queueing system which worked well and helped everything move along smoothly. The timing of the six sessions was a little tight but it was manageable, and the staff were unfailingly cheerful, polite and numerous. 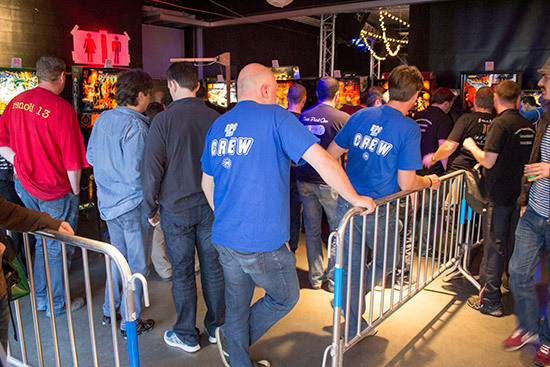 Access to the Classic Tournament area was often difficult due to waiting players crowding the area, with the same thing happening on the stage where the WTIA games were located. But those were only minor issues in what was a slick operation. Congratulations to the team behind it. It will be a hard act to follow.